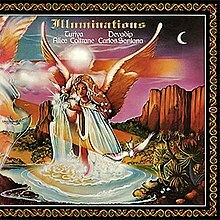 Illuminations is a 1974 collaboration between Alice Coltrane and Carlos Santana. Jazz musicians Jules Broussard, Jack DeJohnette and Dave Holland also contributed to the record, on saxophone, flute, drums and bass. Alice Coltrane delivers some harp glissando, while the string orchestra adds a serene mood to the music. Carlos Santana (whose Indian name "Devadip" appears on the sleeve) plays electric guitar in his own fashion, using feedback, long notes and simple melodies, lending much space to the other instruments. The album is conceived as an instrumental jazz album, with lengthy solos on guitar, saxophone and keyboards. The introduction to "Angel of Air", with its violins, has been sampled by the Cinematic Orchestra. It is his first of three solo albums (the others being Oneness and The Swing of Delight) to be released under his temporary Sanskrit name Devadip Carlos Santana, given to him by Sri Chinmoy. In addition the usual 2 channel stereo version the album was also released in 1974 by Columbia Records in a 4 channel quadraphonic version. In 2017 a reissue of the album was released by Dutton Vocalion in the UK on the Super Audio CD format containing both the stereo and quadraphonic mixes. ^ Christgau, Robert (1981). "Consumer Guide '70s: S". Christgau's Record Guide: Rock Albums of the Seventies. Ticknor & Fields. ISBN 089919026X. Retrieved March 12, 2019 – via robertchristgau.com. "No One to Depend On"
"Europa (Earth's Cry Heaven's Smile)"
"You Know That I Love You"
"Why Don't You & I"
Carlos Santana & Buddy Miles! Live! This 1970s album-related article is a stub. You can help Wikipedia by expanding it. This page was last edited on 12 March 2019, at 09:11 (UTC).